A straight forward kidney bean recipe. A taste of New Orleans cooking. ..
Noodles stir-fried with vegetables and classic Chinese flavourings such as garlic, ginger and sesame oil, make up this popular dish. Serve as a vegetarian main course. ..
A sweet bread dough that can be used in a wide variety of other recipes. ..
A healthy, filling carrot soup recipe ..
A fills-you-up pudding, very simple to make, tastes great, and thorouhly warming if you're out on a cold December evening. .. Cheesecake is one of my all time favourite desserts. This is more work than a cheap packet mix, but you can be sure it is completely vegetarian, and you can also be sure the extra flavour makes the effort worthwhile. .. This is an easy to make appetizer that is always a hit. It is also a good recipe to make with your kids. ..
Something different in the morning? ..
One of my daughters favourite soup recipes. ..
A wonderful hand made loaf. ..
A wonderful thai recipe to kickm start any thai vegetarian meal. ..
Homemade mayonnaise can feel time-consuming, especially with the vigorous whisking it needs. But the taste test really does highlight the difference. ..
Not always easy to find all the ingredients in the UK, but a spciy favourite when we can. ..
A real taste of India, with a genuine Indian curry recipe, suitable for vegetarians. .. Ever popular tomato soup .. I could seriously go fat on doughnuts, and I fight the urge certainly on a monthly basis. When I relent, this is the recipe for veggie doughnuts that I use. Hmmmmmmmm. ..
An old celery soup, which calls for sago, which I guess is little used these days. .. 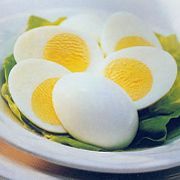 Perfect hard boiled eggs! No dark grey around the yolk, no rubbery textture. Perfect every time. How long do you boil an egg when you want it hard boiled .. 10 minutes, 5 minutes or not at all? .. The original curry soup recipe for vegetarians. Mulligatawny is an Anglo-Indian soup, and apparently regarded as the national soup of India, where the literal translation is 'pepper water'. Rice and noodles can be added to the soup for extra body. ..
A wonderful tamil / indian recipe. ..
Beetroot is never an obvious choice for anything other than being served pickled with a salad, but it makes for some excellent main meals, it's sweet and holds a lot of nutritional benefits. The colour is so rich too. ..
One of my favorite recipes. ..